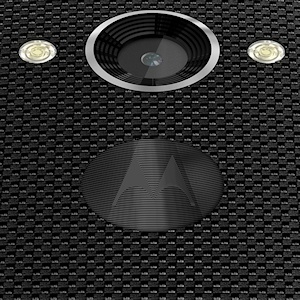 The Motorola Moto Maxx is the worldwide version of the Motorola DROID Turbo that ships exclusively on the US Verizon network. It's a high-end and appealing device, but at the moment it is heading to South American markets only. Although the Moto Maxx has the same size screen and a roughly similar footprint to the Motorola Moto X II, it is actually much more like a shrunk-down version of the Motorola-built Google Nexus 6 instead, with the addition of a very large battery. As with the X, the Moto Maxx has a 5.2" display, but in this case it is a higher resolution 1440 x 2560 pixel panel, the same resolution as the Nexus 6. Also in common with the Nexus 6 it has a 2.7 GHz quad-core Qualcomm Snapdragon 805 CPU, 3GB of RAM and 64GB of non-expandable onboard storage. 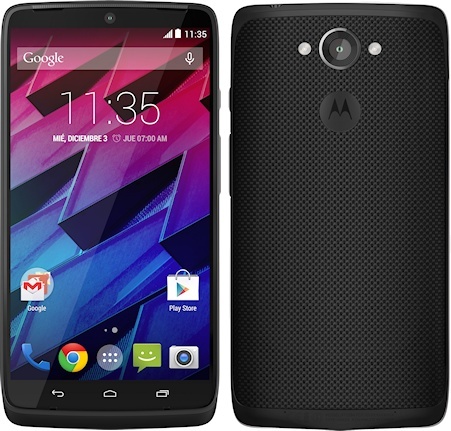 This is an Android 4.4.4 device, although Motorola are promising that it will get quicker upgrades than older models because of the purer Android experience. On the back is a 21 megapixel camera which can shoot 1080p video at 30fps and 2160p video at 24fps, which is impressive. There's a 2 megapixel camera on the front as well. Also on the back is the Kevlar coating that we've seen in some previous DROID and RAZR smartphones. This feature gives the device some character, although otherwise it is a tidy but unexciting affair which appears to be available only in black. One of the headline features is the enormous 3900 mAh battery inside the Moto Maxx, which Motorola claim is the biggest in any smartphone. Probably as a result of this, the Moto Maxx is a heavy device at 176 grams, 20% heavier than the Moto X. This is an LTE-capable device with NFC, and it also comes with wireless charging. In addition it has a Quick Charge mode which can charge the battery up to 60% capacity in 30 minutes. Of course it comes with all the other features you would expect to find in a high-end Android smartphone too. The Motorola Moto Maxx is available now in Brazil, with Mexico following in mid-November and other Latin American markets after that. There is no indication at present that this will come to Europe or other markets, which is a shame.. although it is just possible that some specialist retailers may be able to import it. Incidentally, this will be the first Motorola device to launch under their new owners, Lenovo.